Step 1: Prepare. Without proper preparation, you're off finding stuff and you're food is burning. And what will you want to have on hand before you start? Step 2: Warm the grill up for 5-7 minutes. Then give it a good scraping to clean it. If you want to Pam the grill once it's warmed up, you can do so. The Pam may cause a bit of a flare up, but you'll be fine. Step 3: Start cooking, and go wash the plate you brought the meat out on. Yeah, poisoning your guests tends to be a bit of a downer for the meal. Step 4: Cook until the thermometer says it's done. I've used my brother's Thermapen before, and it really is an absolutely essential grilling tool. It's like X-ray vision for cooking. Yes, it is pricey, but for a novice like me it's worth every penny. 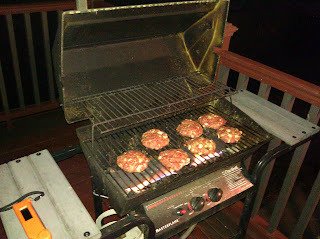 Tonight's burgers got a thumbs up by Shira. Of course, how can you mess up burgers? I'm sure I'll find a way. A deck and a grill - if this isn't living the American dream, I don't know what is.